Times Square is about to light up even more than it already does with the addition of a new 46-story tower that will feature a giant single sign LED advertising sign. This multi-use building will include a performance stage, restaurant, 600-room hotel, and 46-floors of retail. 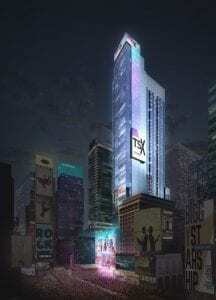 The current DoubleTree Hilton hotel and landmark Palace Theatre located on the corner of 47th street at Broadway and Seventh Avenue will be restored and lifted thirty feet to create the TSX Broadway. Upper floor will have a performance stage overlooking Times Square, a restaurant with a large terrace and the hotel rooms. Data will be an important component in construction and will include 5G integration to allow for more complex ways of advertising and tracking technology to serve ads to people after they have left a store. “It’s part Super Bowl, part experiential mega arena, part center of commerce, part social network,” Essex told CNBC by phone, adding that he expects to have a deal signed this year. Retailers will need to entice their consumers to shop brick-and-mortar and it is expected that the new Times Square giant will attract high-end retailers to fill spaces. To read the full article from CNBC, click here. Are you ready to break ground on your next commercial real estate project? We can help!